Learn how Totem Pole art plays a role in healing among Native American communities from Master Carver Jewell Praying Wolf James. Master carver Jewell Praying Wolf James has been working with wood since childhood, when he learned traditional carving from his family. A citizen of the Lummi Nation in northwestern Washington state, James continued totem carving while at the University of Washington. Among his creations are traditional healing poles for the families who lost loved ones in the September 11th attacks on the World Trade Center, and the Pentagon, and in the flight that crashed in Shanksville, Pennsylvania. 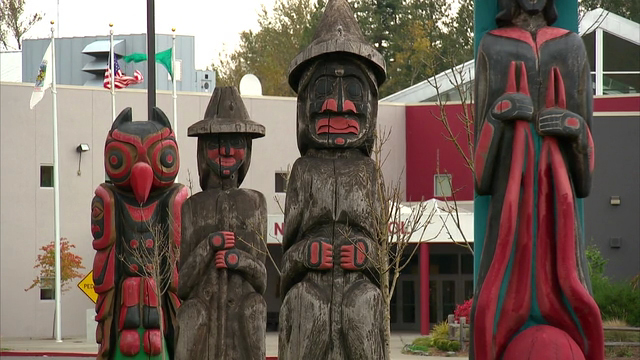 James prefers to carve totem poles from western red cedar trees that are at least 500 years old. Western red cedar is a lightweight wood that resists decay and naturally repels insects. Before the ancient trees are cut and taken to his workshop, James makes a prayer ceremony to bless them for allowing him to remove one from the forest. A single totem pole from one of these trees can take up to 1,000 hours for James and his assistants to carve and paint using a combination of traditional and modern tools and techniques.